Leaders of The Church of Jesus Christ of Latter-day Saints first entered Canada in the winter of 1829-30 seeking ways to finance the publication of the Book of Mormon: Another Testament of Jesus Christ. In 1830, Phineas Young traveled to Earnestown. Though not a member of the Church at that time, he preached about the Book of Mormon. Early in June 1832, Young returned to Canada, this time as a convert to the Church in the company of five other missionaries. Their preaching helped attract enough member to create four branches of the Church. Other missionaries, including Church founder Joseph Smith, visited Ontario in October 1833 and July 1837. Between 1830 and 1850, an estimated 2,500 Canadians, mostly from Ontario, joined the Church. 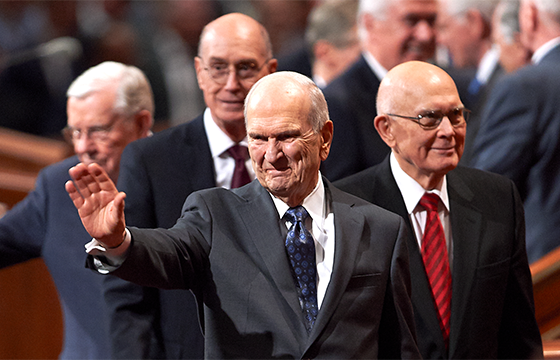 Most of these early members gathered with other Latter-day Saints in the western United States. By 1861, the Ontario census listed only 74 Latter-day Saints. Missionary work progressed slowly in eastern Canada until a mission was organized in 1919. That year, branches were organized in Toronto and Hamilton. Another was organized in Kitchener in 1923. The Ottawa Branch was created in July 1926. The St. Catharine's Branch was organized in 1933. The Oshawa Branch began in 1947 after functioning off and on as a Sunday School since 1944. Membership throughout eastern Canada reached 1,974 in 1950. The first Latter-day Saint meetinghouse in eastern Canada was dedicated in Toronto in 1939 where the first eastern stake (similar to a diocese) was organized in 1960. The Toronto Temple was completed in 1990. On 1 July 1993, a second mission was created in Toronto.